The interactive, web-based course in Dental Anatomy is available to teaching institutions (dentistry and allied dental programs) as a class purchase (one licence for each student). The institutional cost per student is $30.00 CDN (for Canadian institutions) or $30.00 USD (for non-Canadian institutions). This provides a permanent access code to the course to each student. Access codes for instructors in the course will be provided to the institution at no cost. This is a not-for-profit endeavour. Proceeds from the sale of the course will be donated to charity support patient care at Dalhousie University. Over $30,000 has been donated to date. Contact Dr. B. Cleghorn (blaine.cleghorn@dal.ca) for further information. As of December 1, 2011, individuals can now obtain access to the full Dental Anatomy course by making a $50.00 CDN donation directly to the Juvenile Diabetes Research Foundation of Canada (JDRF) Juvenile Diabetes Research Foundation of Canada any time after this date. The donor will receive a tax receipt from JDRF. Send a copy of the JDRF tax receipt to Dr. B. Cleghorn (blaine.cleghorn@dal.ca) as confirmation of the donation and instructions for access to the site will be provided. 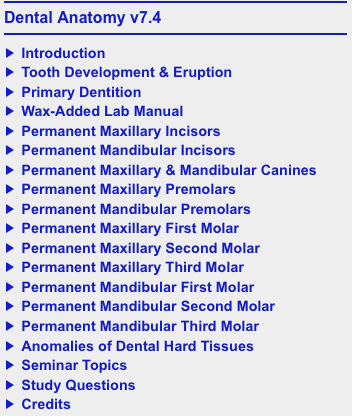 I am interested in the web-based Dental Anatomy course for my institution. I am interested in contributing to the Mock OSCE Exam. Open access to the Mock OSCE Exam site is now available. Click on the Mock OSCE Exam link on the main page and register for a new account (Register Here). An automated email will be generated confirming the registration. Click on the link provided in the email to access the Mock OSCE Exam site. Faculty members are encouraged to contribute content to the site. Contact Dr. B. Cleghorn (blaine.cleghorn@dal.ca) for further information.